Rainbow Falls is one of the biggest and most scenic falls in the region. 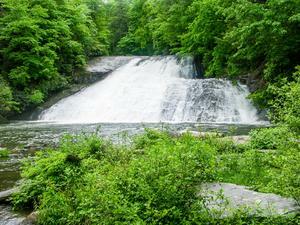 An excellent 3-mile round trip hike takes you there, accessible from the newly expanded Gorges State Park access area. Several more smaller falls and some more scenery are located above Rainbow Falls, in case you're up for a longer hike of 4 miles round-trip. From downtown Brevard, NC, it is just over 18 miles on US 64 West to the intersection with NC Hwy 281 South - turn left. From Highlands, it's just over 20 miles on US 64 East, thru Cashiers, to NC 281 South - turn right. Go 0.9 miles South on NC 281 from US 64 to the park entrance road on the left. It's about a mile to the Rainbow Falls parking area straight ahead, past the visitor center and turn-off for the loop road. Start the hike on the trail leading away from the sign boards. 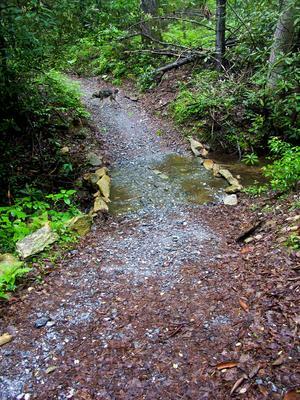 The first section of trail you will hike has a gravel surface. It leads gently uphill at first, but very soon begins descending. From the very beginning, you can hear the roar of the Horsepasture River in the valley far below, which you'll reach in about 1 mile. The trail winds downhill through a ridge-top forest and intersects an old roadbed just after a hairpin turn. Bear right to continue on the trail. The old roadbed continues downhill as well, and its surface has also been graveled. It resembles more of an ATV track than a trail at this point. The roar of the river grows louder before fading completely as you dip into a side cove. 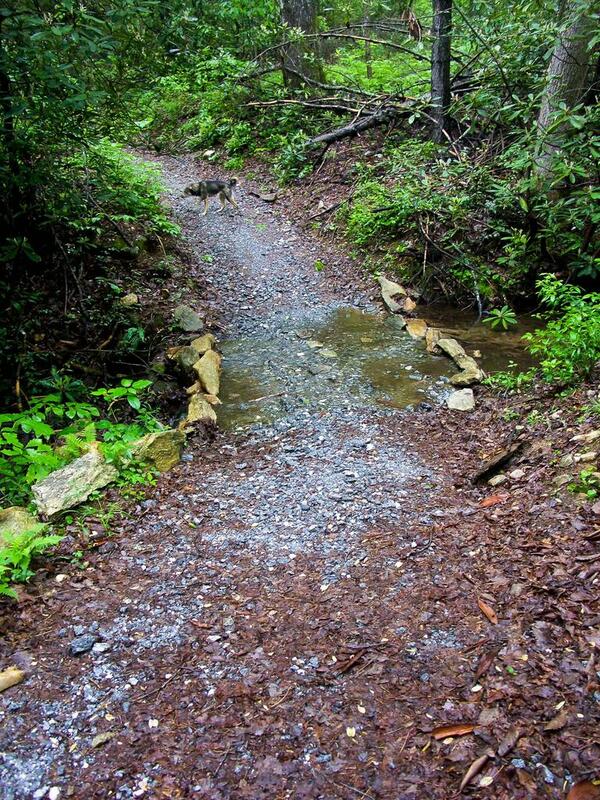 You'll notice the trail getting a bit steeper before it crosses a small stream. Just past this crossing, the trail passes off of Gorges State Park property and onto National Forest property. 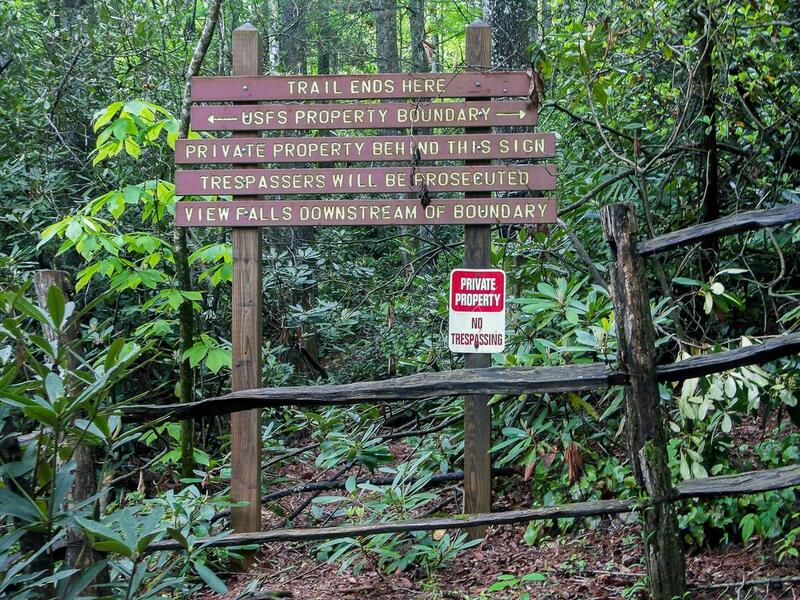 It's still called the Rainbow Falls trail (#499). Once it it crosses onto the National Forest - and into the Horsepasture Wild and Scenic River corridor - the trail is no longer gravel-surfaced and blazed; however, it is easy to follow. It's the same old road bed you were on before anyhow. 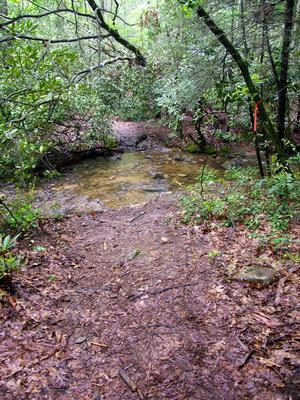 The trail descends a bit more steeply to another, larger creek crossing. You'll get your feet wet on this one if the water is up. At this point you're near the river. Some narrower paths thread through the woods on the left just before the creek - that is the trail to Stairway Falls, which is not officially part of this hike. Make note of it, so that on the way back you can visit if you'd like. Rainbow Falls - the main attraction on this hike. There are several cascades along this stretch of river, interspersed by deep pools - but nothing like what lies just upstream. The trail will begin a more significant climb before long and that's when you know you're getting close to Rainbow Falls. About 1/2 mile past the campsite, the trail curves right, into an open area created by mist from the raging cascade. That's where you get your first view of the falls, from behind a fence along the trail. This frontal view of the falls is the best place to see the rainbows in the mist that give the falls its name. They're primarily visible in the morning, when the sun is low. They're also notoriously difficult to photograph, since when the sun is shining, the light is not always the best - and the mist will be constantly trying to soak your lens and ruin your camera. The opening is thought to be kept open naturally by the constant spray mist and wind from the falls. During a flood, the wind coming up the slope here is almost enough to knock you off your feet! The trail goes through the mist zone and goes back into the forest on the other side of the opening. Another path splits left just before the trail goes into the forest. This little spur runs close to the base of the falls on the right side, to a neat view of it from beside the cliff. Scramble paths lead to the rocks in front of the falls, but if you choose to go that way, be extremely careful. The strong sun and constant mist mean all the mud, grass, and rocks are completely covered by an impossibly slippery slime. You'll get soaked, too. 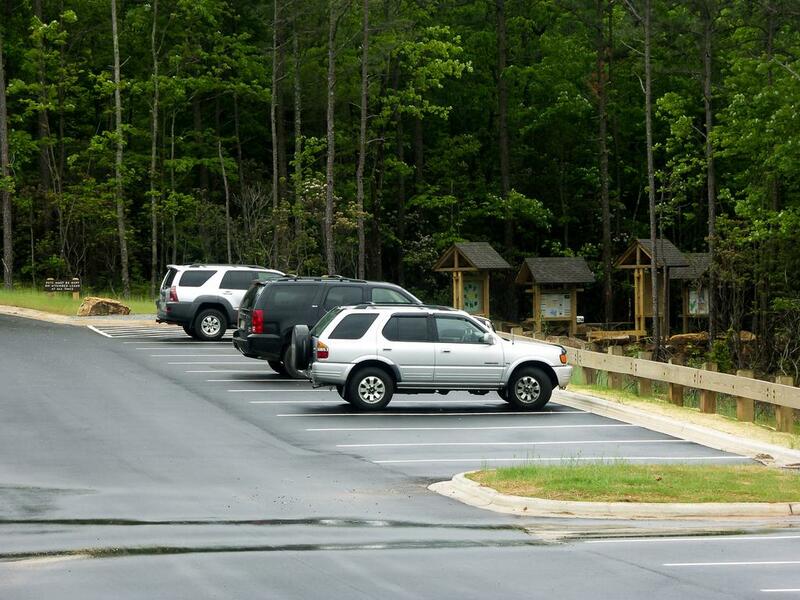 You can return to your vehicle from here to make this a 3-mile round trip hike as officially advertised by the State Park. However, the trail - and optionally, the hike - continues about a half mile further upstream to a couple of smaller cascades and waterfalls. If you promise not to take unnecessary risks, it's well worth the effort required to see them. 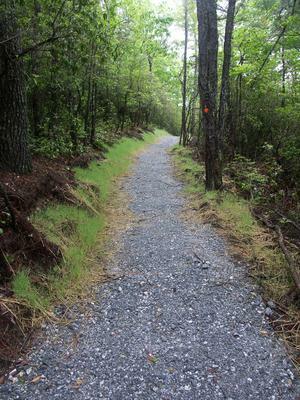 The trail climbs steeply as it winds up and around toward the top of Rainbow Falls. It's eroded in places, with steep side slopes eating into the trail surface. Use caution - it's not a cliff or anything, but it's a steep dirt slope below the trail. The trail comes out at a point on the ridge near the top of the falls. Many people leave safety and go out the rocks or even into the water near the brink of the falls; many have unnecessarily died here trying to do just that. The most recent accident at Rainbow Falls happened in July 2003 (Source 2) August 2003 September 2008 June 2010 July 2013 July 2016. In no case was anyone hurt who didn't risk it and just stayed on the trail. It's best to enjoy the awesome view way back from the edge of the river or any slick rocks. The trail continues upstream, passing some nice slides, cascades, and agitated pools, and reaches Turtleback Falls in about 0.2 mile. Remember, this section of the river is extremely risky to explore up-close, so just enjoy it from the trail. As you approach Turtleback Falls, a little side path leads to a boulder with a great front view of the rounded falls, which ends in a deep, churning pool. 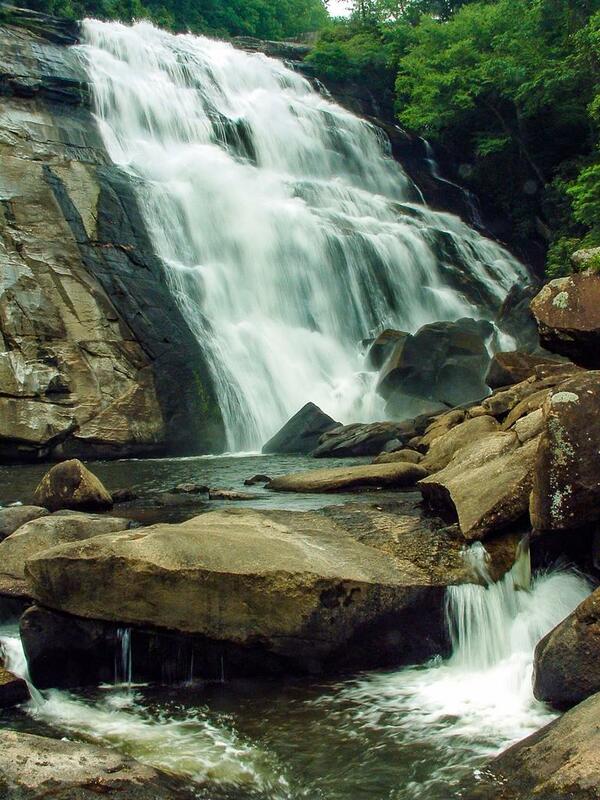 Turtleback Falls is about 0.2 miles up the trail from Rainbow Falls. 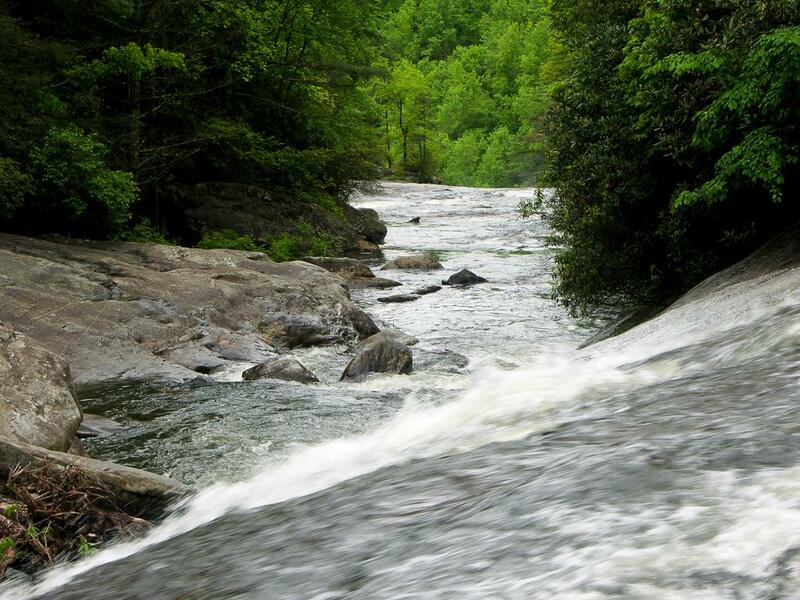 Turtleback Falls is a popular sliding, swimming, and jumping spot. But you've seen what's just downstream, and people have been swept from here all the way over the brink of Rainbow Falls. I do not recommend getting in the Horsepasture River at all. Turtleback Falls looks like a great spot to slide and swim at first glance, but look downstream and you can see the brink of Rainbow Falls with swift river water in between. 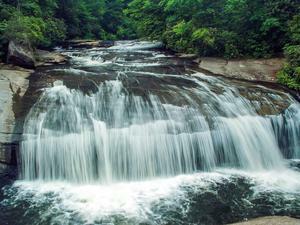 It is not wise to enter the river above Rainbow Falls, period. It's about another 1/4 mile to Drift Falls from here. The trail continues around Turtleback Falls, crossing a small trickling tributary, and then comes out on the rocks above the main drop. Then it continues upstream, going back into the woods. You'll reach a junction - the rocky trail to the right, going steeply uphill, used to lead to NC 281. That trail is now closed. So bear left, continuing to follow the river. 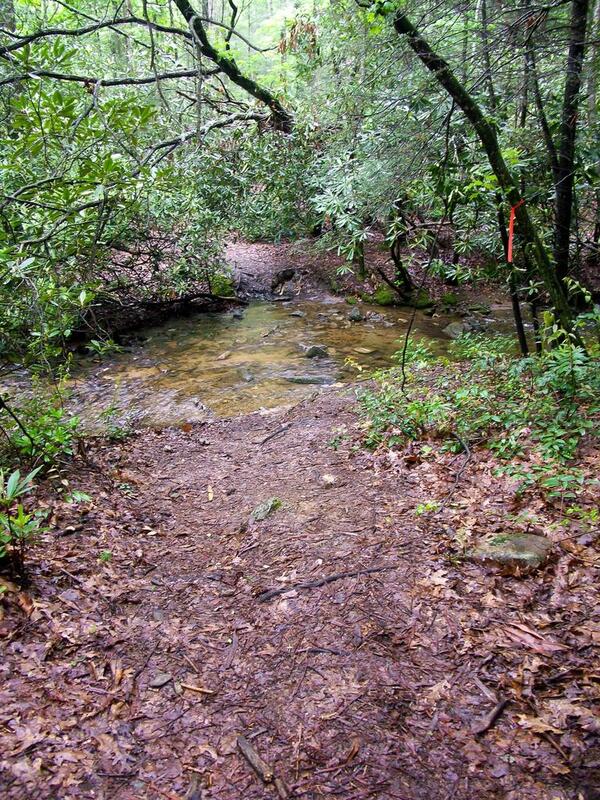 The trail winds through a flat area, crosses over a small tributary stream, and ends abruptly at a huge sign at the private property boundary. Go left, down a small scramble path onto the river rocks, to get a view of Drift Falls across its plunge pool. But be sure to stay back from the private property line. (There are plenty of signs to remind you). Thankfully, there is plenty of room to view the falls from National Forest property. Drift Falls is about a quarter mile up the trail from Turtleback Falls. Unfortunately, you cant get any closer than this without trespassing, but this view is legal. When you've seen enough, return to your vehicle on the same path. Angela said: I am looking to hike the Rainbow Falls and Turtleback Falls. 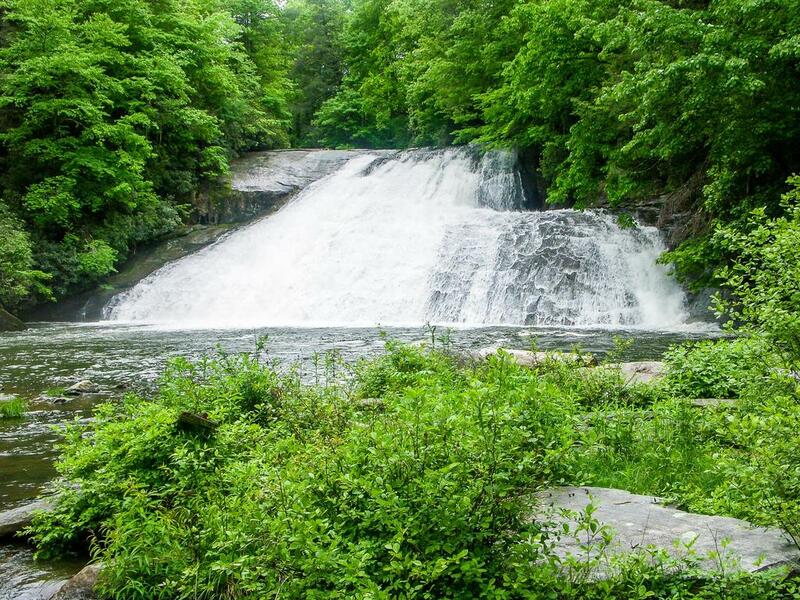 I talked to the agent on the phone and get the information that it is a 3-mile hike from the Gorges State Park trail entrance to Rainbow Falls and another 1 mile to Turtleback Falls. 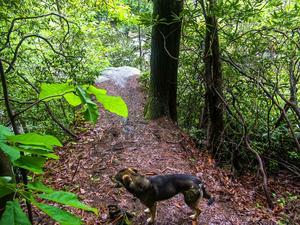 You mentioned Pisgah National Forest another that needs to further hike for another mile and half. 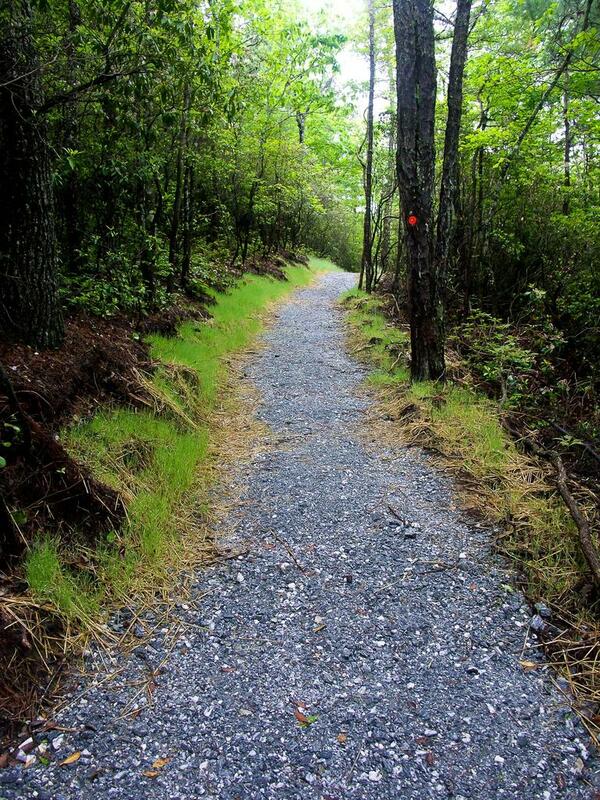 With no experience at these trails, it will be nice to hear what you have to say. Jordan M. said: Mark - according to the best GPS data I have, it's 1.379km or 0.85mi from the trailhead parking to the park boundary, and 2.492km or 1.55mi all the way from the trailhead parking area to the overlook for the falls. It might be off some, but even if it was off a tenth of a mile it'd still only be 3.2 round trip. Without rolling a measuring wheel down the trail or doing an actual survey, I'm not sure how much more accurate it can get! I'm pretty sure the figures here are accurate, but if you have some more data or something to share that shows it's farther I'll be glad to take a look! 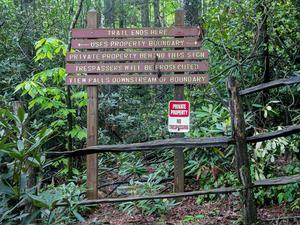 Mark Mikrut said: Please revise the length you report for the hike to Rainbow Falls. We have done this hike several times. It's 1½ miles to the BORDER of the state park and at least another 1½ miles in the Pisgah National Forest till you get to the falls, making it closer to a SIX MILE round trip. 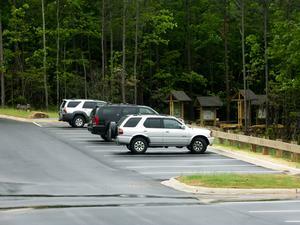 The length reported at the trail head only measures the distance in the state park.